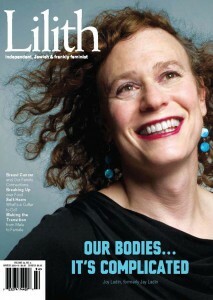 Joy Ladin, the transgender professor at Stern College, was featured on Lilith’s cover in Winter 2009-2010; Joan Roth’s gorgeous photo of Joy has become something of an icon. Joy’s memoir in that issue of Lilith formed part of a continuum of Lilith’s coverage of transgender Jews. I’d had several opportunities to talk with Joy, first during that memorable photo shoot, her first, I believe, as a woman, and later at a Lilith salon where she so generously, in her concentratedly soft voice, said, “Ask me anything you want.” And so we did. This podcast is a recorded conversation we had at Washington’s DCJCC. She’s wonderfully instructive, sometimes in deeply poignant ways; listen carefully here when she describes, among other things, the plight of transgender teens and their very basic need for shelter. Mostly, though, she’s talking with depth and smarts about her own responses to social and political issues, literature, the Jewish tradition. I think you’ll agree with me that she’s a pleasure to listen to. Susan Weidman Schneider is editor in chief of Lilith magazine.